Going crazy with using chestnuts these past few days lead me into dessert realm. If I could keep my hand out of the jar and stop snacking on these tasty morsels, they would actually make it into more things. 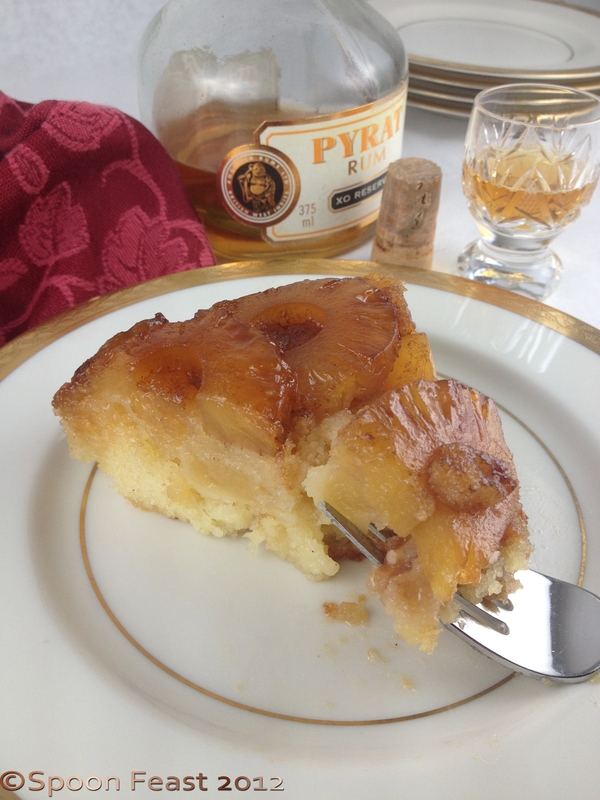 Pineapple Upside Down Cake is one thing you can do. Please, forget about tho se horrible neon glaring cherries Betty Crocker used. This is a cake for adults because it has rum in it. Of course you could leave it out or use rum flavoring, but there isn’t anything quite like Pyrat Rum. Upside down baking is a rather nice idea actually and can be adapted to may other fruits as well. One you may have heard of is the French famous Tarte Tatin. Flip the baked cake or tart over onto a plate and the bottom of the pan becomes the most wonderful caramelized fruity topping. What a novel idea, upside down baking. I found a can of baby pineapple rings at a gourmet store that were screaming to be made into a cake. With waning warm weather, this cake brings you smack dab into a nice tropical get-away. You can use regular pineapple rings too. You may want to cut them to make an overlapping pattern. You want enough so every hole has a chestnut. Or sprinkle chopped chestnuts over pineapple. Drain the pineapple, reserving juice for the cake batter. Using a 9″ heavy bottomed saute pan, melt the butter and the brown sugar. Once melted, allow to simmer for 4 minutes, do not stir once simmering begins. After 4 minutes, remove from heat and carefully place the pineapple all over the surface of the caramel. Be careful about touching the caramel as it is very hot. 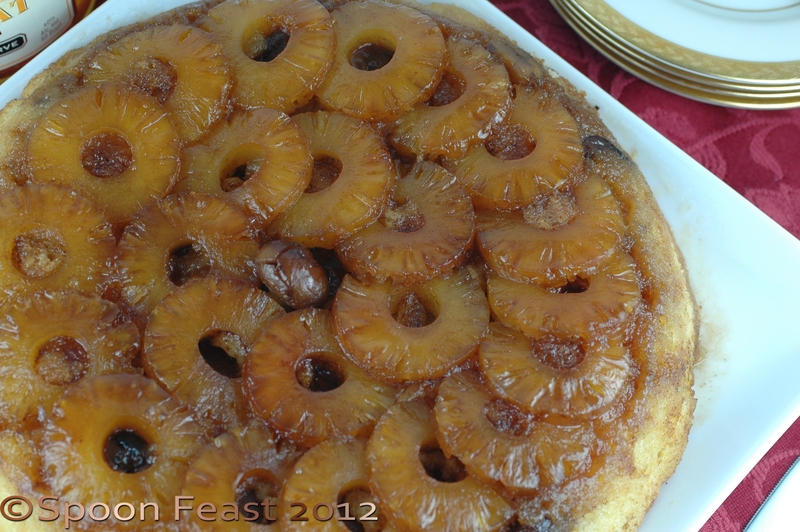 Arrange pineapple over caramel, place a chestnut over each hole or sprinkle them on. Overlapping the pineapple, cover the entire surface of the pan. Fill each hole with a chestnut half. 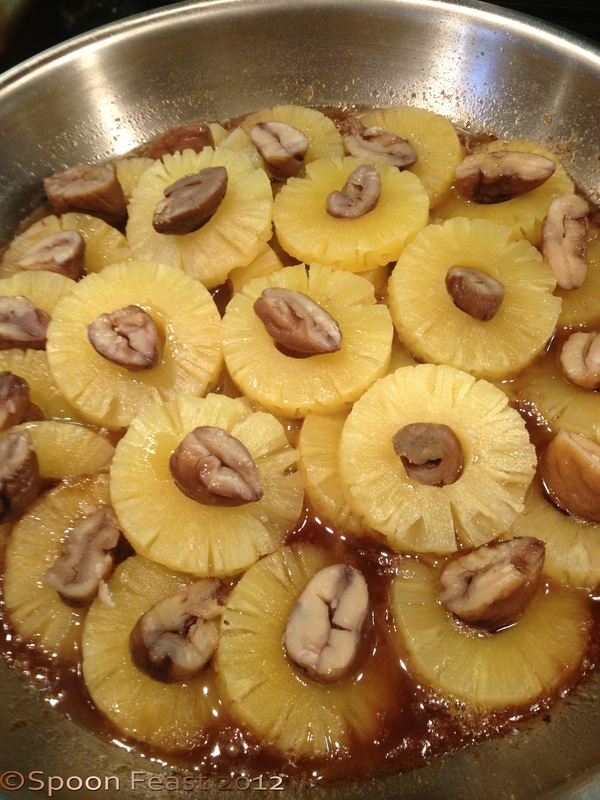 If chopping, sprinkle the surface of the pineapple with the chopped chestnuts. Sift these together and set aside. Using an electric mixer, whip the soft butter until it is light and fluffy. Gradually add the sugar and then the eggs, one at a time. Add the vanilla and rum then add the pineapple juice. The mixture will separate and look like a mess, but move on. Add the flour in two stages. Once the flour is added, the mixture looks just fine. Pour the batter over the fruit and caramel. Bake. Pour the batter over the pineapple and chestnuts. Place the pan into a 350°F oven for 45-50 minutes. Test for doneness with a toothpick. When it comes out clean, the cake is done. Remove the pan from the oven. Keep a cloth on the handle so no one burns their hands on a hot handle while the cake cools. Lay a folded towel on the counter. Place the cake pan on the towel. Place the serving plate over the pan. Fold the towel over the plate and holding it all tightly together, flip it so the cake turns out onto the plate. Hopefully, all the pineapple will also follow. If not, just replace them. If you like, sprinkle a bit of rum over the top of the cake. Totally optional. Exploring Upside Down Baking is on the agenda for this winter. What about an Upside Down Banana’s Foster Cake? 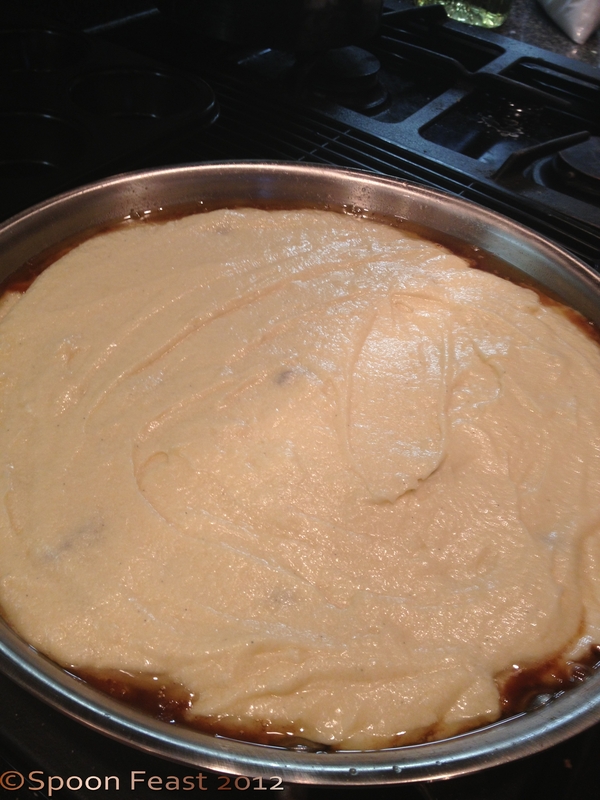 This entry was posted in Cooking, Recipes, Southern Cooking and tagged Baking, Betty Crocker, Caramel, Chestnut, Pineapple, Sugar, Tarte Tatin, Upside-down cake. Bookmark the permalink. I love your version of pineapple upside down cake. No matter the season, this sounds wonderful. The chestnuts sound like a great addition. Are canned okay? Yes, I would think they would be just fine.